Esta nota de The New York Times publicada en septiembre 2915 pasó casi desapercibida en El Salvador, a pesar del revelador experimento empresarial que describe: hacer compatible la eficiencia empresarial con la inclusión social. CIUDAD ARCE, El Salvador — The gang tattoo etched sharply on William Amaya Valladares would bar him from a regular job in much of the country. But here he is, the menacing stamp of the Mara Salvatrucha gang crawling up his neck, as he sweeps the seams of T-shirts bearing American college logos through a buzzing sewing machine at breakneck speed. On any given day, the T-shirts may read U Mass, Penn State, or Florida Gators — conjuring buoyant images of student life that could hardly be further from Mr. Amaya’s reality. But after spending much of his youth in one of El Salvador’s most notorious gangs, all that matters now to Mr. Amaya, 24, is a job that pays enough to support him and his two children. He joined MS-13, as the gang is known, when he was 14 years old, seeking the companionship and sense of community he couldn’t find at home. Neither lasted. In El Salvador, torn by social discord and a surge of criminal violence, hope seems dim for the nation’s youth. But Rodrigo Bolaños, the general manager of the League factory here, believes in small triumphs. 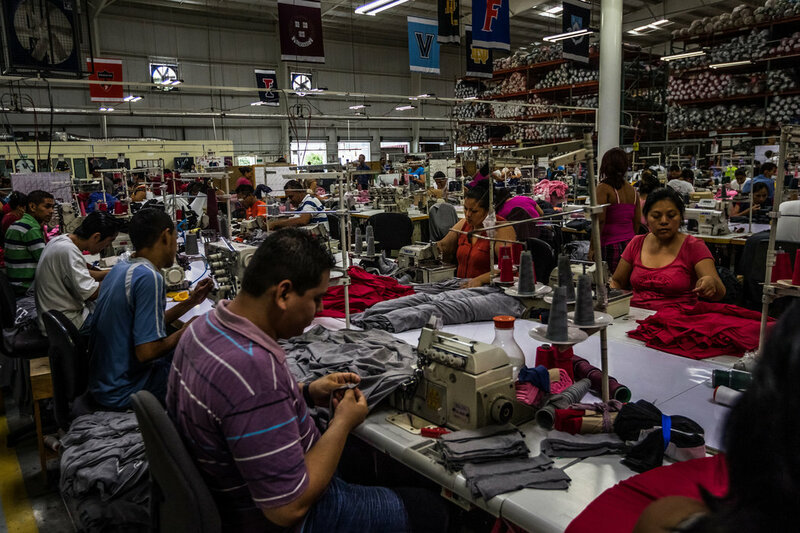 An American-educated industrial engineer by training, Mr. Bolaños combines missionary fervor with the competitive jargon of the garment industry. In his experience, hiring people whom nobody else will employ makes business sense. Module No. 6 at the plant is staffed by former gang members like Mr. Amaya, who add up to some 50 people working in the plant. They do not connect what they make with a world of wealth and advantage, Mr. Bolaños said. El Salvador is reeling from violence at levels not seen since the civil war of the 1980s, as the government struggles to rein in the gangs that control neighborhoods in many of the country’s cities and towns. In August, there were 911 murders, surpassing the previous record of 670 in June. More than 50 percent of the dead were under the age of 30, according to the coroner’s office. In a broad security plan designed by a citizens’ government advisory council — “Safe El Salvador” — creating jobs for young people is the first, and one of the most expensive, proposals. It is certainly uppermost on the minds of those who work with young people. Mr. Bolaños has his own solution: Hire anybody who wants to work. Francisco Huezo is one of them. He had fallen on such hard times that even the gang he joined at 12, Barrio 18, kicked him out. For a couple of years, he was living under a traffic bridge in San Salvador with his girlfriend, Beatriz, and her two children, stealing money for crack and heroin and scavenging for food in the trash. Then, one day in January, at the suggestion of an evangelical pastor, a drug-dazed Mr. Huezo went for a tour of the League plant. Mr. Bolaños offered him a job. Mr. Huezo, 24, swore off drugs. He rented a covered corner at the edge of a vacant lot, strung a plastic curtain in front of it to make a home and enrolled the children — 13-year-old Cecilia and 9-year-old Roberto — in school for the first time. In June, other workers from the factory chipped in to buy metal sheeting and built a tiny house on the lot. “It feels good to have a good job,” he said. A study published this year by the United Nations Development Program confirmed the experience of the former gang members at the factory: Young people join a gang for acceptance and status. “From being just another scared kid in the neighborhood, the gang member gets a network that supports him and even though it demands his loyalty and his life, it rewards him with an identity, power and economic support,” the report said. But there are no great riches for those on the lowest rung. A recent article in the investigative online newspaper El Faro described how leaders of a gang cell gave sneakers as Christmas bonuses to the members. An outing for gang members consists of calling a taxi to go to a shopping mall, just to eat and wander around, said a Catholic priest in one neighborhood where a gang has taken over a house just outside the parish church. To hear Mr. Amaya tell it, gang life is suffused with boredom punctuated by violence. “We would get up to hang out, do nothing, go out to the corner, get high, run from the police, listen to music,” he said. He said he sold drugs on the street and shook down businesses. “The Coke trucks had to pay $4 every time they wanted to make a delivery in the neighborhood,” he said. The money went to buy weapons. “To rise in the gang, you have to defend territory,” he said. Every worker spends half an hour on a computer each workday practicing English through an online course. The factory pays for high school equivalency classes and has just arranged with a local university to offer a two-year engineering degree. The company subsidizes a clinic, day care, breakfast and lunch, adjusts schedules for employees studying for a college degree, and has even set up a plan to lend money to people who want to raise tilapia in tanks at home for extra income. The efforts raise labor costs — to some $500 a month for each worker overall, compared to the average wage of about $300 a month in garment plants. But the benefits eliminate turnover, Mr. Bolaños said, which ultimately generate savings. The factory has just hired about 100 new workers and plans to add another 150 or so to reach 700 by December, Mr. Bolaños said. He hopes to offer jobs to residents of the poor neighborhood nearby, including those finishing prison sentences. A few minutes’ drive from the plant sit the shells of some 100 houses abandoned after a low-income housing developer ran out of money. 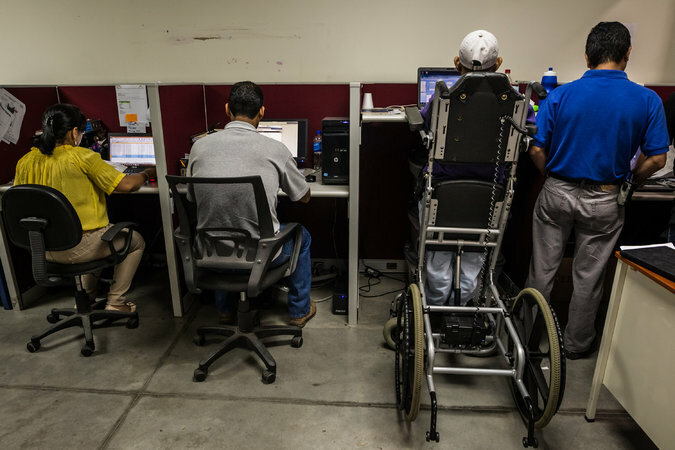 Mr. Bolaños has outfitted two of them for disabled employees, who sleep under cotton quilts made for the University of Illinois and Quinnipiac University. His plan is to raise money to restore the rest of the houses for workers, complete with green spaces. Speaking animatedly, he began to walk along the path between derelict rows of two-room dwellings. Suddenly, the air seemed to thicken. Young men glared from the window space of one house. A gang cell had taken it over.